For the past six and a half years, this site has been very vocal in pointing out President Obama's lousy policy decisions, not all of them of course because there have been so many of them, but a good portion of them. It is also important to point out those rare cases where his policies actually help this country and/or the world. Since the beginning of 2014, representatives from Israel and Saudi Arabia have had five secret meetings to discuss a common foe, Iran. On Thursday, the two countries came out of the closet by revealing this covert diplomacy at the Council on Foreign Relations in Washington. Among those who follow the Middle East closely, it's been an open secret that Israel and Saudi Arabia have a common interest in thwarting Iran. But until Thursday, actual diplomacy between the two was never officially acknowledged. Saudi Arabia still doesn't recognize Israel's right to exist. 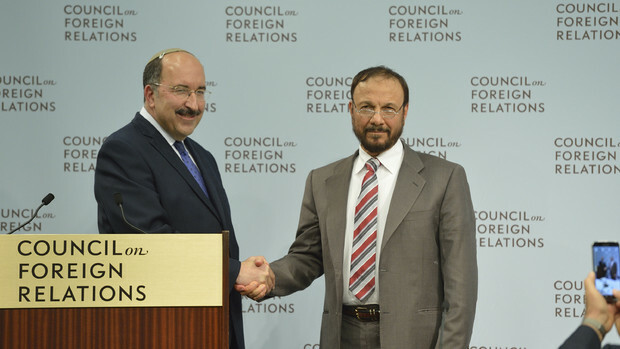 Israel has yet to accept a Saudi-initiated peace offer to create a Palestinian state. The two countries would have never started talking to each other if they weren't worried Barack Obama was going to sell them out out to Iran with his P+5 nuclear negotiations. The Sunni Muslim Saudi's are extremely worried about the expansionist, terror-supporting Shi'a Muslim Iran. Iran has constantly threatened to destroy Israel...So Barack Obama's flawed negotiations with Iran have pushed Saudi Arabia and Israel together. It is an accidental unintended consequence, and it its pushing both Israel and the Saudis away from this president...but it is...finally an Obama achievement. Of course he is setting off a nuclear arms race in the Middle East, and perhaps even a regional war, but thanks to Barack Obama Saudi Arabia and Israel are on the same anti-Obama side.